AtMail is an open source webmail client written in PHP. They aim to provide a elegant Ajax webmail client for existing IMAP mailservers, with less bloat and a focus on an intuitive, simple user interface. 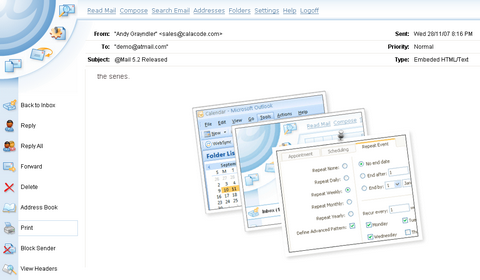 The open source version of AtMail provides users with a lightweight, yet powerful webmail client. The software can be installed on a variety of platforms with ease and without the hassles that most webmail platforms impart. Traditional desktop mail clients are in decline; the future of email is via a web interface. AtMail is poised to deliver the next generation in Open Source Webmail. David Greiner from Vitamin explains what you need to do to ensure that your emails not only look great in today’s email clients but also actually make it to where they’re going. Getting your email to look good is only one piece of the puzzle, so he has dedicated the second half of this article to recommendations on how you can improve the chances of your emails actually getting delivered. This article is really well written and useful, you should not miss it if you would like your clients / readers can read your emails properly. View the full article on Ensuring your HTML emails look great and get delivered. Getting your email to look great in all the major email clients can be a challenge at times, so Campaign Monitor has done the hard work for you with 30 free email templates. They have tested them in all the major email clients, so add your own content and you’re all set. Grab all 30 templates in a single 113k zip file from 30 free HTML email templates. However, not everybody has an email client that can show HTML, and some people just prefer plain text. CampaignMonitor got permission from the creators of three really well designed plain text newsletters to share modified forms of their format with you, which should save you some time and make sure that your plain text readers aren’t missing out. You can view them on Plain text templates and formatting tips. RoundCube is a modern webmail solution which is easy to install and that runs on a standard PHP/MySQL configuration. The skins use the latest web standards such as XHTML and CSS 2. There are many exciting features RoundCube provides, for example, Multilingual capabilities, Full support of HTML, Find-as-you-type address book integration, Spell Checking and Complete customization with skins. RoundCube Webmail is released under the GPL License. Everyone is welcome to download and use it, deploy it and to re-distribute it.